Adult colouring book has been a very popular hobby in recent years. The adult colouring books are not the same as the kids colouring book. For adult colouring books, the patterns used are more detailed and intricate, and often more abstract and complicated. 5. Useful for caregivers- who often have to spend long periods of time beside patients or family members that are unwell. 6. A fulfilling hobby- because usually the effects turn out beautifully even if you don’t consider yourself artistic. It can also brings out the creativity sparks in you. 7. Enables you to go into an almost meditative mood during the colouring process. Adults, just like children, benefit from playtime as means of relieving stress and detaching from the difficulties of a modern life by engaging the brain in many ways. Colouring draws you in to focus on the lines, the movements and the colours in front of you, while engaging your imagination and creativity. With these colouring books for adults, you create your own rules and satisfy your creative desires without needing to be an artist. You revisit your childhood and find peace in a simple activity. In the past, when I am stuck in boring meetings (the type of meetings that I don’t really need to attend but was dragged into), I would pacify my hyperactive and restless mind through doodling. 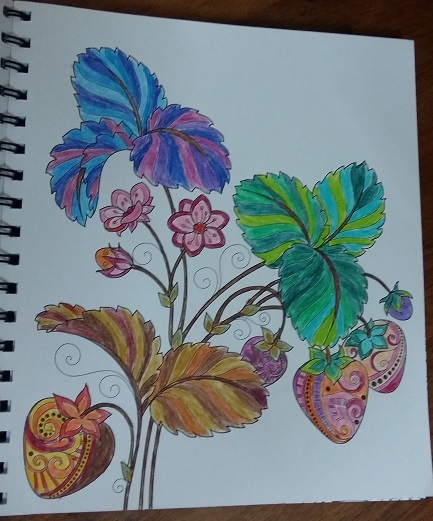 I especially love to draw patterns of flowers and leaves. However, due to my lack of artistic skills in drawing, the pictures I drew were not inspiring. 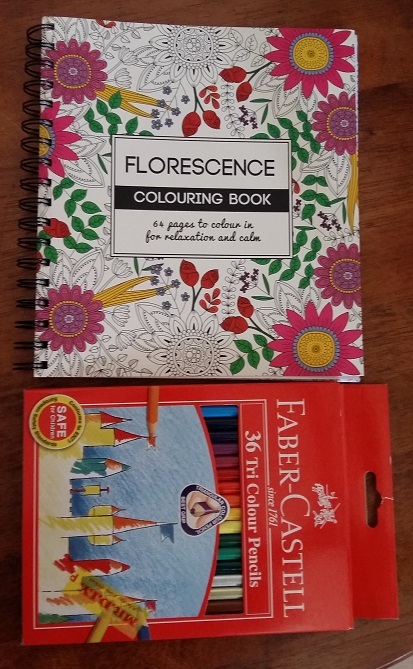 That is why when I found the colouring book that carries the theme of flowers- I am so happy and I bought it. I also bought colour pencils to help me to colour the book. So long as one stick to the lines and colour, the finished pictures will turn out at least nice and often unexpectedly different. When we are doing colouring, we can choose any colour that we like- leaves can be blue or pink, a leopard can be red or a ladybird purple colour. No one is there to fault or judge us. We can bring out our creative talents while enjoying with the array of colours. It is a fulfilling hobby because the finished pages can be used for various purposes such as a partition to our planners or decorate our wall/desk space. Hence, even if our lives are going upside down, and even though we face disappointments or sadness, there is a sense of accomplishment that comes from colouring. The process of colouring also has that relaxing effect that stop making us feel very worked up over things. And the end result we may feel that even though we may not be considered creative, or cannot get things right, there is one result that we can feel happy and accomplished about. As a caregiver, it is good for me to spend more time with my mom. Due to my mom’s health condition, she often prefers to rest in the bed and she could really love some company. In the past, when I spend time with her, I would be also looking at my phone to check emails or read online articles. Smartphones are seriously distracting. I felt I am not doing justice as I am not ‘present’ sufficiently enough if I am checking on stuff on my phone or watching YouTube videos. After I bought my colouring book, I was colouring the pictures as I accompany her to chat. The act of colouring calmed me down and even though my fingers are busy colouring, my mind is focused on what she is saying. As the act of colouring is therapeutic, I also do not get stressed or if she brings up unpleasant issues I do not get upset. And I was able to respond to her as well as if I am in a normal conversation or just quietly being there with her. The experience of coloring is very different from mindlessly surfing the phone while trying to spend some quiet time with someone. Likely this is because colouring uses the creative side of the brain (the right brain). Whereas conversing and digesting the contents in the Smartphone seemed to be utilizing the same component of our brain hence it is hard to focus on a real conversation when we are engrossed with the Smartphone. I believe an adult colouring book is also therapeutic for a family member who needs to spend a long time by the bedside of a family member either in a hospital or a nursing home. There is also something going on (not related to my mom) that had really upset me and I was able to channel the energies towards colouring which helped me to deal with the situation with calm (instead of losing my temper). Another good way to destress and calm down the mind would be to take a nice walk preferably at a park or at nature. However we may not always be able to do so (such as if the weather does not permit or safety issues), it is good to have an adult colouring book at hand. Parents tend to like to push over an iPad or Smartphone for their kids to use when their kids start demanding for attention. This may begin as early as the moment their kids could hold on to something because the games usually would distract and quiet the kid down. However I find this habit to be really unhealthy as a child would be growing up accustomed to mental stimuli. They would not be able to live without Smartphones or internet. Too much of external stimuli and non centering of the mind can give rise to anxiety disorders and susceptibility to addiction and depression later on. I like what Allison Lindstrom said in her YouTube video on “How to Plan Your Day- Blogger Edition” (at 4.55 minutes) that she uses a legal pad to plan her blog and video posts. She would usually take a legal pad with her and while her son is playing at the park, she would write and jot down ideas. She realized that planning using paper can be considered redundant or does not make sense to some people. A very touching thing she mentioned is that even though she has to rewrite the post later on her computer, she still choose to do that because she knows that she is having someone really looking up to her, and she wanted to set a good example to her son. So she does not want to be on an electronic device all the time. I regularly watches Allison’s videos in YouTube because I find her to be a very genuine person who cared for others. In fact, I’ve rewatched the video above a number of times because she is the only person who spoke about putting down an electronic device when she is with her child. There is something about typing away or being on an electronic device that always make the person that you are with feel ignored or unimportant. I know families nowadays tend to do that- whereby all you need to do is look around at any restaurant and you would see all the members engrossed on a Smartphone while waiting for their orders instead of talking to each other. Also while stopping at traffic lights, everyone except the driver would be engrossed in the Smartphone. Sometimes even the driver himself is also checking the phone while at traffic light. Seriously, it is not a good way to spend quality time together. If you do not need to plan blog posts or write down ideas, you may consider substituting it with a colouring book- buy 2 versions- children colouring books for your kids and adult colouring book for yourself. Start from young and the quiet time spend together doing an activity that is considered fun would be a treasured memory in time to come. When I was young, we do not have colouring books for adults (so nothing for my mom to use, and even if there is, she would not spend it on herself) but I remembered the times when we baked together. Or the quiet times when she sat down and did some quilting (for our blankets) and I would be sitting near her doing my homework or just chatting with her. Those stand out in memory more compared to going to the movies or watching TV together (which can be exciting during that time but less memorable years down the road).